Looking to change the boot order on your Windows machine? By changing the boot order, you can force your computer to boot from a CD/DVD drive, a USB stick, or even off the network. Changing the boot order on a PC is normally done in order to boot from a recovery disk or from an OEM disk that runs some kind of Windows repair software, such as the Recovery Console. It also comes in handy when you need to perform an offline virus scan. Step 1: The first thing you have to do is restart your computer and enter the BIOS. You can enter the BIOS when you see a message such as “Press FX to enter setup” or something similar. On a Dell machine it’s usually F2 or F12, Toshiba is F1 or ESC, HP is F1 or F2, and IBMs usually require you to go to Start, Programs and then Thinkpad CFG to start up in the BIOS. Step 2: Now that you are in the BIOS, the next part is finding the boot order section. Note that there are not a ton of options in a BIOS, so just go through every page if you have to until you see something like First Boot Device, Boot Order, Boot Management, Boot Sequence, Boot, etc. It may also be under Advanced BIOS Features or Advanced Boot Options. 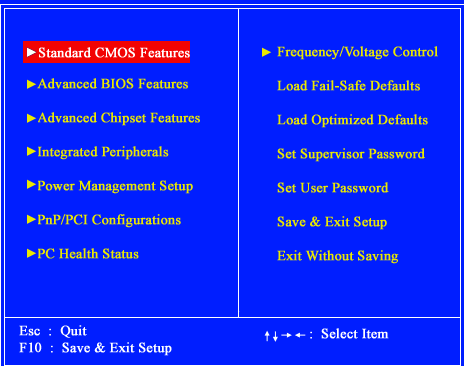 In the above screenshot, it’s under Advanced BIOS Features. Use the arrow keys to navigate. 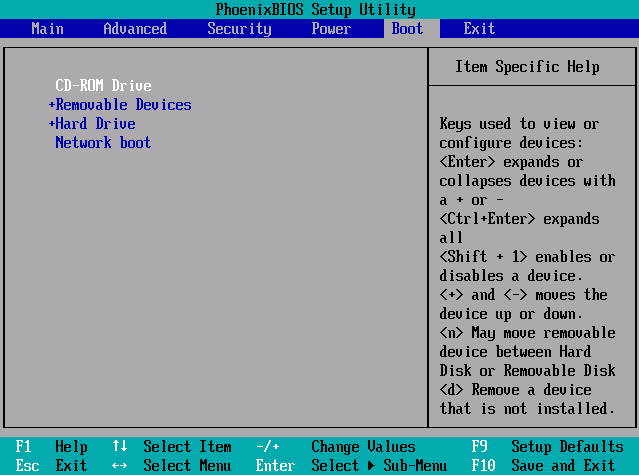 The instructions for changing the boot order are in the sidebar, but usually it requires pressing the + or – buttons to move items up and down in the order list. The first item in the list is what will be scanned first when booting. If boot media is not found, it will try the second device and so on. In the above case, I just have to press Enter on one of the items and it gives me a list to choose from. 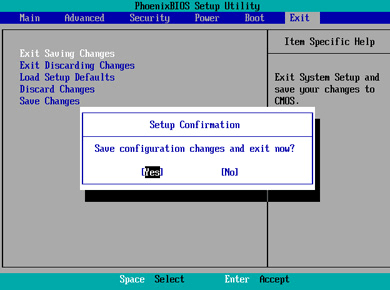 Finally, go to Exit and make sure you choose Yes to the Save configuration changes and exit now? question. That’s pretty much it! If you have any questions or can’t get into the BIOS on your computer, post a comment here and I will try to help! Enjoy!